takes away one of White's liberties and sets up a snapback; if White captures at a, Black will capture three stones. White is one liberty behind and loses the capturing race. 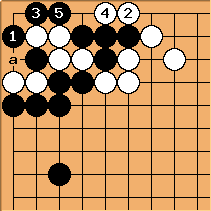 Capturing the two white stones doesn't reduce White's liberties and Black loses the race.